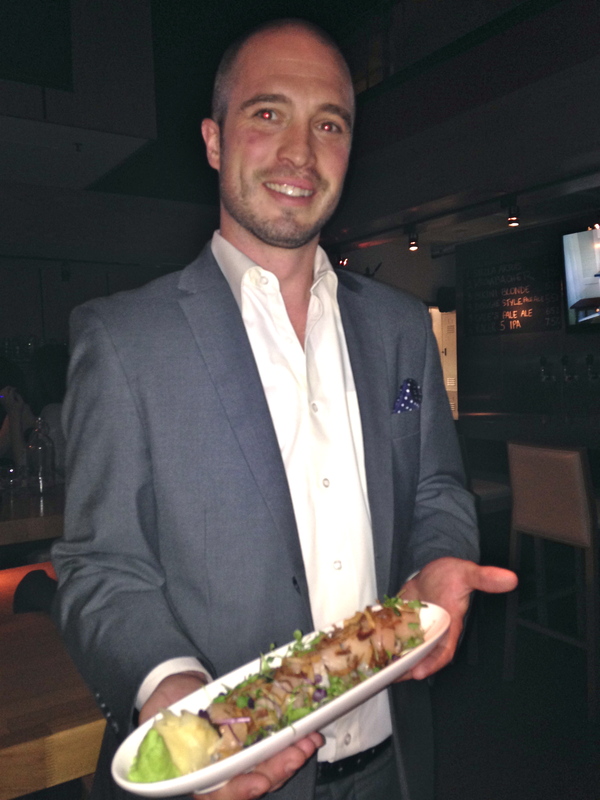 The downtown restaurant and bar scene has blossomed over the past few years. A newish-hot sports bar is Bunker Hill Bar & Grill, located on the ground floor of a downtown Los Angeles landmark building at Fifth and Flower. This comfortable lunch and after-work place joins the Kwan brothers group of restaurants that include multiple Wokcano’s, the nearby Le Ka, and Green Hut Café. Inside are stylish wood, cocktail-height tables with low back stools and tables with cream-colored high back chairs. There are 11 flat screens showing different sporting events and one outside on the spacious patio overlooking the downtown public library. During the lunch hour, people stream out of various office buildings for sushi, burgers and sandwiches, or healthy quinoa bowl. Choose from basil garlic marinated salmon with asparagus; pan seared chicken breast or a spicy green chicken curry. Interesting sandwiches include the brie and pear, the fried chicken with jalepeño sauce, and the Mexican BBQ pork belly. Prices range from mostly from $9-12, however, if you want to splurge at lunch, try the lobster roll with tarragon, melted butter and sea salt for $18. After work, the well-dressed business crowd stops in for a small batch draft beer (a dozen taps to choose from) or creative cocktails that range from a Pimm’s Cup aperitif, to a whiskey inspired Bunker Hill Old Fashion or Gin Aquas Frescas with fresh lime, cilantro and cucumber juice. Happy Hour starts at 3 pm and goes ‘til 7, offering $5 beers on tap and a host of bar bites from sushi rolls, wings and wraps to tacos and sliders. General Manager Jeffrey Midlam hand selects the beer menu. He offered us a taste of the Dales Pale Ale brewed by Oskar Blues Brewery in Longmont, Colorado. “This beer goes nicely with one of the burgers or the spicy albacore roll with crispy shallots and micro greens,” Midlam said. It has a golden orange color with bubbles and a head that dissipatesquickly. It’s slightly creamy with a hint of apricot and complex taste that lingers. 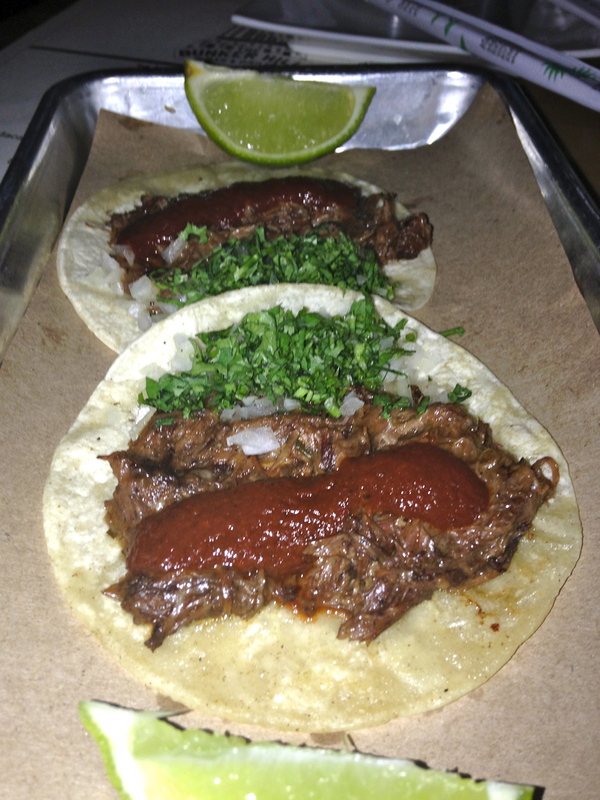 We ordered the beef short rib tacos that arrived two on a plate, and the truffle burger sliders to accompany the ale. The sliders were topped with sautéed mushrooms, arugula, Munster cheese and a unique truffle shaving sauce with shiitake aioli. These little burgers were wonderful. Midlam really likes the beers from Maui Brewing Company in Lahaina. The Maui Bikini Blonde Lager is brewed with floral hops and is bold, smooth and refreshing. It goes well with a pasta dish or the prime rib eye with fries. Midlam also offered a handcrafted Maui Coconut Porter. The silky smooth chocolate brown porter had a hint of coffee flavor with a toasted coconut and hoppy spice finish. I enjoyed this with a white and spongy Peking duck on a Bao bun and Peking duck wrap. For sweets they offer two desserts – a chocolate bread pudding or ice cream cookie sandwiches filled with vanilla or chocolate ice cream between two-better than average housemade chocolate-chip cookies. Happy Hour is 3 to 7 p.m. during the week and 11 a.m. to 7 p.m. on Saturday and Sunday with all draft beer at $5 and the House Snap Dragon Wine from Sonoma at $4 a glass. This article was published in the February 20 issue of the Beverly Press and Park LaBrea News.